In the 20's, there was The Lost Generation, the 50's, The Beat Generation, and in the 90's...The Suicide Generation. 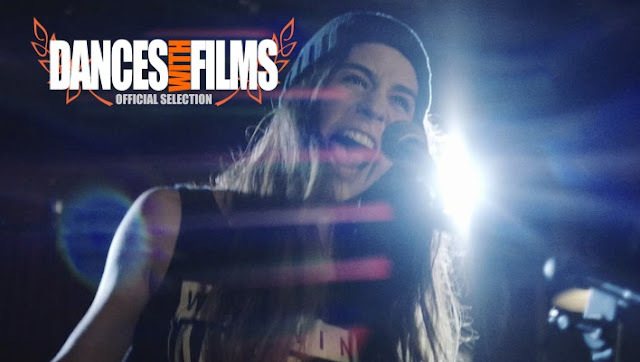 NO ALTERNATIVE is a teen drama set in the world of grunge-era teenagers in the early 90s. Thomas Harrison is determined to start his own alternative band after the suicide of Kurt Cobain -- it's an obsession that blinds him to what's either the mental collapse or the eruption of musical genius, of his little sister, Bridget. Bridget boldly rejects her brother's music, and the music of an entire generation of slackers, by taking on the persona of a gangsta' rapper named "Bri Da B." Today I had the chance to chat with William Dickerson about his film NO ALTERNATIVE that will be premiering at DANCES WITH FILMS on Thursday, June 7th at 8 pm. I’m doing well. I’m also doing a lot of running around, preparing for our premiere at Dances With Films, but it’s the kind of running around that I love doing! When I read the description of your film, I assumed the title was a play on the compilation album of the same name. Was that choice intended to be a misdirect? Depending on how you view the film, the title is hopeful or bleak, either way, it’s far more than just a 90’s callback. I am a huge fan of that compilation and have listened to it countless times when it came out in the 90’s. It’s not a play on that album, but I was aware of the record when I titled the film NO ALTERNATIVE. There is no better title for the movie, in my opinion, as it not only speaks to the genre of music popular in that era (the story takes place in 1994), but also speaks to the feeling some mentally ill people have when faced with drug addiction and suicide; they quite often feel there’s no escape from their pain, and therefore seek refuge through drugs, and in some cases, suicide, as a means to end the pain. How important was getting the music right? It was incredibly important and probably the hardest aspect of the film to get right. The story involves two musical artists: the grunge band, Latterday Saints, and the gangsta’ rapper, Bri Da B. All of their songs needed to be prerecorded and played back on set during production—it is the same process as shooting a music video; however, it’s much more difficult because the performances have to seem natural, organic and as though the musicians are playing live and off-the-cuff. It took a great deal of rehearsal, and in the case of Conor Proft, who plays Thomas Harrison, he had to learn to play the drums in two weeks! We also knew we needed more songs on top of the original music in the film in order to compile a soundtrack that firmly places the viewer in that era. In looking at your bio, I wasn’t surprised to see that you are a musician. Not unlike looking through an old Trapper Keeper filled with high school poetry, the bands conversations are embarrassingly honest. For me, they reflect actual discussions I had in the 90’s. Four guys sitting in a basement, with one song under their belts, talking about what labels are looking for… yup, been there. Can you talk about the casting process for the film? I’m glad those scenes resonated with you. I do feel like, while this story is indeed unique to me, so much of it is relatable and true to teenagers’ experiences in the 90’s, no matter where they grew up. We were all connected through the music. The casting process was challenging because I wanted to hire actors who were also musicians. My casting director, Judy Bowman, made sure to bring in as many actors who could also play instruments, and as it turned out, we were able to cast a number of musicians in the film. As I mentioned, Conor had to learn drums for the part, but the other band members already knew their instruments quite well, so that made directing them much easier. In the film, Bridget a white female suburbanite takes on the persona of “Bri Da B”, a black male rapper. I understand this character is based loosely on or inspired by your real life sister; can you talk a little bit about using real-life relationships for works of fiction? How do you strike the balance between honoring a loved one and honoring the story you are trying to tell? Many of the characters in this film are inspired by real people. Some scenes are pulled directly out of my life—or my sister’s life—and some are not. The very definition of drama is conflict. If everything were a literal reflection of something that really happened, watching the film would be a rather boring experience. I made sure to balance the real with the unreal as best I could, and when using dramatic license, I stayed as true to the spirit of the characters as possible. My sister, on the other hand, was far from boring and out of all the characters in the film, the character of Bridget “Bri Da B” Harrison is the most true-to-life. My sister suffered from Borderline Personality Disorder; however, she was able to use her art, in this case, hip-hop, to channel her turbulent emotions. In some respects, her music was a byproduct of her illness. My sister was a tortured individual who didn’t fit into the world the way she was supposed to. Rapping gave her the chance to be someone else, expressing herself through music she loved, and that provided some semblance of relief from her illness. Whenever she performed, people didn’t know whether to be offended, to laugh, to leave, to dance, or what—it was this communication breakdown of emotion she evoked in people that reflected some measure of brilliance. As a mentally ill person in a society that alienates the mentally ill, she found a home in this persona, the persona of someone from another alienated culture. Was taking, and perhaps co-opting, the persona of a black rapper a “crazy” thing to do? Perhaps. Is there sometimes a spark of genius in those who are mentally ill? I think so. The raps in the film are all raps that my sister wrote—the lyrics are sometimes misogynistic and filled with not-safe-for-work language—and I must tell you I used the mildest ones. You never condescend to your characters nor do you put them on a pedestal. You simply allow them to move through their emotional arcs. Considering some of the films thematic elements, how conscious were you of inadvertently glorifying your characters actions? I was and I wasn’t conscious of this. This story has been with me my whole life. I wrote a novel about it and then began making this movie. As long as I remained true to the characters and their actions, I knew I could do the story justice. No human being is perfect; we all have our problems. If someone says they’ve never thought about suicide, I have a real hard time believing that. One in four people suffer from mental illness in the United States, and those are just the ones who are diagnosed. Men and women of all ages suffer silently, societal shame choking back their voices. Strides have been made, but as a culture, we still aren’t open about mental illness in the way we should be. I’ve decided to talk about it, to be as open as I can, and do so the best way I know how: through the medium of film. The behavior of the characters in this film is not perfect; however, I made sure to neither condemn them nor glorify them. We currently live in an age where blanket condemnation, or blanket glorification, is the norm—the context of ones behavior, context that is vast and complex, is often summarily ignored. Context becomes even more important when considering the struggles of the mentally ill. Since mental illness sometimes isn’t as obvious as, say, a broken leg, we often rush to judgment when confronted by the actions of the mentally ill. We may even attribute such behavior as a choice or rooted in some kind of moral failing. These types of knee-jerk reactions are extremely dangerous to people and they only serve to further oppress the lives of those living with mental illness. Have any family members or childhood friends seen the film? If so, how have they reacted to it? My Co-Producer, Liam McKiernan, is one of those childhood friends I grew up with who is a part of this story. The character of Connor Russell, played by Eli Bridges, was inspired by him. Liam had a front row seat to the entire process! My other friends and family have not seen the film yet; this is because I want them to wait and watch it on the big screen. Liam loves the film. I hope the rest of my family and friends do, too. An odd romanticism of the 90’s reminds me how the baby boomers look back at the 60’s. Some see the 1990’s as the last great decade of music, literature, and film. Do you think every generation views itself that way? In a sense, every generation does view itself that way—unless you came of age in 80’s. I don’t know how you justify that decade. I’m kidding, of course. Sort of. There is no denying the cultural impact that music in the early 90’s had on a generation of teenagers. There has not been as important a cultural movement since. I hope there will be another, and soon; we, as a country, need it I think. There was a zeitgeist in the 90’s. Teenagers—the kids of the boomers—were supposed to be all right, but that white picket fence was just hiding a darkness that was growing, a darkness that the music of that era touched on in ways that are difficult to articulate. We felt alienated, and the songs of the time encapsulated that alienation. It was ironic: we all felt alone, but since we all listened to the same music, we weren’t alone. Is there a song from the 90’s that encapsulates NO ALTERNATIVE for you? You will make him happy. And you'll think you're happy. If the “him” in these lyrics is society, and the “you” is the mentally ill, this song speaks to exactly what I’m going for. Society would rather keep the mentally ill, and their nonstandard behavior, inside a jar, made seemingly happy by prescription medications, instead of dealing with their issues head-on. How can people find more information on the film? NO ALTERNATIVE will have its world premiere as the Opening Night Film at the Dances With Films Festival in Hollywood on June 7th at 8PM. It is open to the public and you can get tickets HERE. For more info and updates on the film, please subscribe to my website: www.williamdickersonfilmmaker.com, like our Facebook page, https://www.facebook.com/noaltfilm/, and follow the film on Twitter and Instagram: @NoAltFilm.